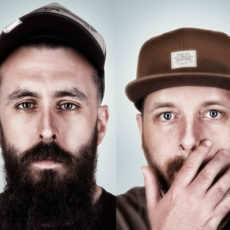 UK phenomenon dan le sac Vs Scroobius Pip first signed to Strange Famous Records in 2008, allowing the label to bring their first LP Angles to American audiences. The album was a smashing success, buoyed by the strength of the singles “Look For The Woman” and the genre-classic “Thou Shalt Always Kill”, as well as their first US tour and an appearance on NBC’s Last Call with Carson Daly. dan and Pip have since amicably parted ways to explore solo careers, as the group project was always intended to be a finite arrangement. The future and its possibilities, however, are infinite, and while we wait in hope for a triumphant reunion, the pair will remain SFR-4-L(I)FE.